New Matchbox Die in the Occassions mini! As soon as I saw this new Big Shot die, I knew that I had to have it! Not only did I have a million ideas in my head, but then my friend Stasia posted this link to another demos blog, with this amazing project and I just had to copy it! So here is my take on the treasure chest. I used the new Walk in the Park DSP that will be available on April 1st in the new Occassions mini catalog. For the drawer pulls, I used the Jumbo Eyelets and Clear Rhinestone brads. The ribbon is the Organza. For this one, I used the Pink Flamingo DSP and for the drawer pulls, I used the new Small Grommets and some Grosgrain ribbon. I decided to use this one as my new holder for my Inchies. The box that I had them in was getting a little small. Here are a few more of the awesome swap cards I received from the Big Shot and Favorite new set swap. This one was made by Dawn Byers. This creation is by Laura Davis.... and finally the last one was made by Tami Carder-Loos. Aren't they amazing? I love how each of these talented ladies used the Simple Flower embosslit, yet made them look so different. Color Challenge for St. Patty's Day! I hope you are enjoying your St. Patrick's Day! With a name like Kelly Mahoney, you know I am wearing my green today! I was also paper crafting in Green for this week's color challenge! This week was anything green. 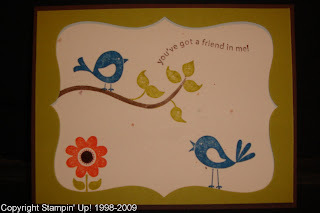 This card also fits two other challenge's - The Weekend Sketch challenge by Beate and friends and the current Creative Challenge to use at least 2 different dies and the Big Shot on your project. I started with a Certainly Celery Card. I used the Top Note die and made a Whisper White and a Sale-a-Bration DSP top note. I layered those together and attached them to the card. I wrapped a piece of Organza ribbon around it. 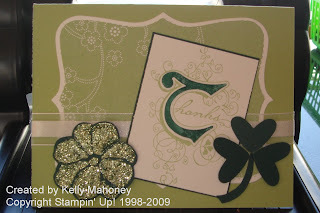 Next, I stamped Thanks from the Illuminations stamp set in Certainly Celery ink. I also stamped the "t" in Handsome Hunter (I almost wrote Forest Foliage - Silly me!) and cut it out and layered it on top of the Stamped piece. I layered that piece and another piece of Handsome Hunter that was just a tiny bit larger than the white. Next, I used the Big SHot again and with Handsome Hunter Cs and the Simple Flower embosslit, I made that flower on the bottom of the card. I added some Tombow Multi Purpose adhesive and some green glitter. This was then adhered with a Dimensional. For the clover, I used the Heart to Heart punch and punched out 3 of the fat hearts from Handsome Hunter cs. I free hand cut the stem and attached all to the card. Also, I wanted to share with you a few pics from this weekend. We took the kids to see the Circus at the Izod center. They had a blast and so did we!! Ok, Here are a few more of the Big shot and Favorite stamp set swap cards! This one was made by Tina Rosenkrans. 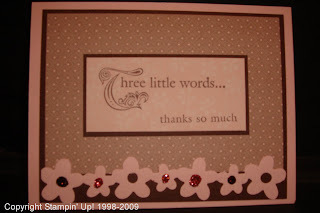 She used the Three Little Words set and the Flowers Decorative Strip Big Shot die. 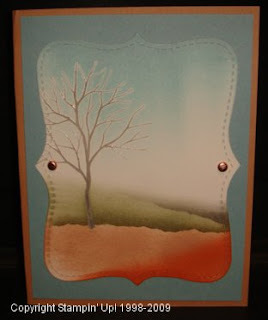 The next card was made by Beth Riis. 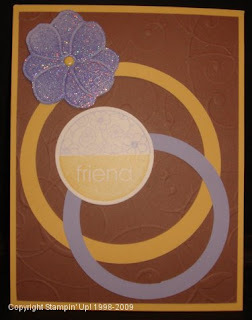 She used the Love you Much stamp set and the Scallop Circle #2 Big Shot Die. 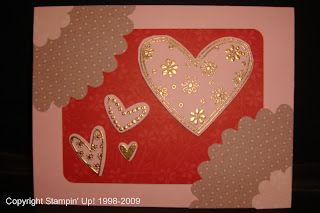 Both cards use the Candy Lane DSP and Pink Pirouette card stock. See you tomorrow for some more cards! I recently joined a swap. 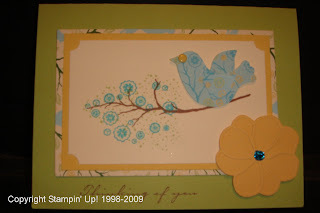 The swap was to make a card using your favorite new stamp set and the Big Shot. The cards I got back were amazing!! So I thought I would share them with you over the next few days. This first one is my card. 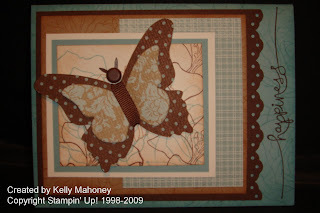 I used the Fifth Avenue Floral set and the Beautiful Butterflies Bigz Die for the Big shot. The "Happiness" comes from the Heard from the Heart set. The colors are Baja Breeze, Chocolate Chip, and Creamy Caramel. 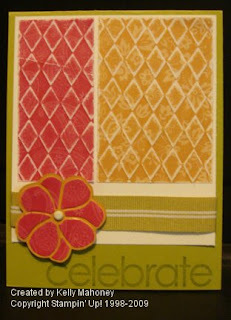 I also used some of the new specialty Designer Series Paper called Parisian Breeze! I love this stuff. It is definitely a must have!!! This next card was made by Jen Peel. She used the Thoughts and Prayers set and the Top Note Die for the Big Shot. The colors used were Chocloate Chip, Bordering Blue and Whisper White. Isn't that a beautiful tree? Like I said above, check back over the next few days for more of these amazing cards! The card you see below is a very special card! Not only was it made with by me with love - which makes it special all by itself, but it also satifies the requirements for two different challenges! First, is this week's color challenge. The colors this week are: Perfect Plum, Old Olive, Rose Red, and More Mustard. THese are not colors I would have thought to put together, but I really like them so much! I can definitely see using this color combo again. That is a great thing about taking on challenges to do things you may not do on your own. The second challenge is the current Creative Challenge. The challenge is to flip through the current catalog and stop on a random page. Then, pick one of the projects from that page and use that for your inspiration. You can use the colors, stamps, layout, or anything about the project to inspire you. So I took this card from page 114 and changed the colors to go with this week's colors. The two circles were cut out using the new Circle Cutter. The stamps used were Pick a Petal and Stem Sayings. 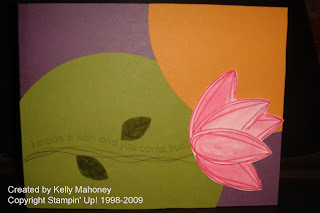 I also used an Aqua painter on the flower petals and the 5 petal flower punch to make leaves for the stem of the flower. This week the colors were Old Olive, Real Red, More Mustard and Very Vanilla. I combined this challenge with the Weekend Sketch Challenge (This week, hosted by Lori.) This color combo was a little tough for me. Anyway, I stated with an Old Olive card. I added the very Vanilla panel. Next, I took two pieces of Designer Series Paper from the Hostess packs. The smaller one is Real red and the Larger is More Mustard. I ran these through my Big Shot with the Texturz plates. I chose the diamond plate. Next, I sanded the 2 pieces a little bit to make the design stand out. 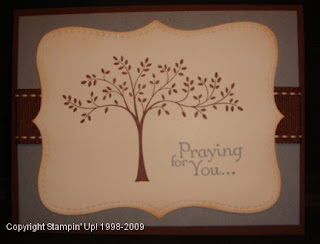 This will only work on Designer Series Stampin' Up! papers as these do not have color all the way through like our card stock does. I was really happy with this look. After I adhered those two panels to the card, I added the Kiwi Kiss ribbon. I needed the embellishment on the left side. So, I took my Simple Flower Embosslit and ran that through my big shot with More Mustard card stock. I didn't think that was quite enough.... It just wasn't doing it for me. So I ran it through again with the Real Red Designer Series Paper. I cut out the separate petals and adhered them to the More Mustard flower using the Tombow Multi Purpose adhesive. 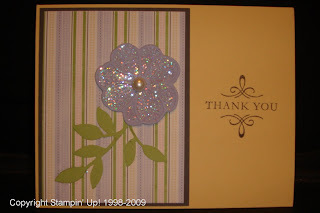 Finally, I added the brad from the Styled Vanilla Hodgepodge Hardware in the center of the flower and stamped "celebrate" on the bottom of the card in Old Olive ink. Well, I am a little late posting this challenge. I had a few ideas, but never got them down on paper until yesterday! Thank God for Snow Days! So the latest Creative Challenge was for a Fancy Fold. 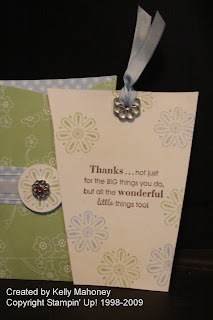 It could be a card, scrapbook page or 3-d item as long as it had a special fold. The picture above is the outside sleeve. For this, I traced the template on the Designer paper. Then, I added the strip of Bashful Blue Designer paper and the Organza ribbon. I stamped the flower image in Certainly Celery ink on Textured white card stock and punched it out with my 1 1/4" circle punch. I punched a hole in the middle and added the Filigree brad and Fire Rhinestone brad to the center. I adhered it to the card with Dimensionals. 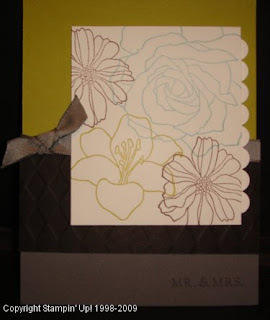 The card is made out of Textured Whisper White Card Stock. 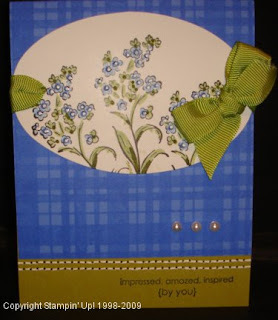 I stamped it with the flower image for Polka Dot Punches (Sale-a-bration set) in Bashful Blue and Certainly Celery. The sentiment was stamped in Chocolate Chip ink and comes fromt eh Full of Life set. 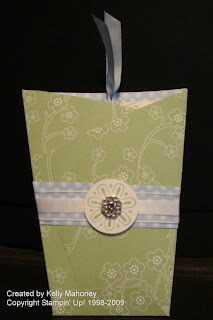 Finally, I added the hole on top with the Filigree charm and Bashful Blue Taffeta ribbon.